This Web site is provided by the Agency for Toxic Substances and Disease Registry (ATSDR) ONLY as an historical reference for the public health community. It is no longer being maintained and the data it contains may no longer be current and/or accurate. 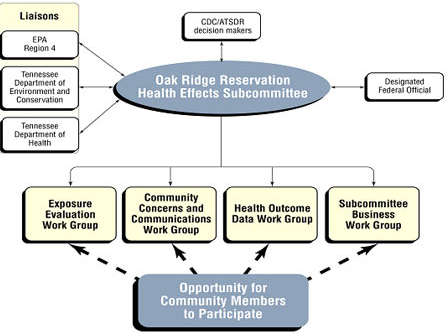 The Oak Ridge Reservation Health Effects Subcommittee (ORRHES) was established in 1999 by Agency for Toxic Substances and Disease Registry (ATSDR) and the Centers for Disease Control and Prevention (CDC). The purpose of ORRHES was to give advice and recommendations about off-site public health activities and research conducted by ATSDR and CDC at the Department of Energy's Oak Ridge Reservation, in Tennessee. Further, this subcommittee provided a public forum for communication and collaborations between the citizens and agencies that evaluated public health issues and conducted public health activities at the Oak Ridge Reservation. Served as a citizen advisory group to CDC and ATSDR and gave recommendations on public health activities and research at the Oak Ridge Reservation. Allowed citizens to communicate with agency staff members and learn more about the public health assessment process and other public health activities. public health issues and community concerns reviewed by ATSDR. The fact sheet, prepared by the ORRHES, is on available medical resources to provide guidance to persons seeking medical assistance for an environmentally or occupationally related illness or injury. The members of the subcommittee sought to involve and talk to with those who were interested in and affected by ATSDR and CDC public health activities at the Oak Ridge Reservation. The ORRHES Subcommittee also encouraged the public to provide input to the federal agencies and to learn about public health activities at the Oak Ridge Reservation. ORRHES created a series of formal programs to inform and have meaningful conversations with the public in the affected communities. The ORRHES held 26 public meetings in the Oak Ridge area from 2000-2005. The minutes of the ORRHES are available for review. The figure below graphically demonstrates opportunities community members had to participate in ORRHES meetings. The ORRHES created workgroups in the ATSDR Oak Ridge Field Office in Oak Ridge, TN to fulfill its mission for providing advice and recommendations to ATSDR on public health activities in critical areas. To help ensure participation, the meetings of the subcommittee’s work groups were open to the public. ATSDR scientists presented detailed technical data and information on the public health assessments at the work group meetings. Between 2000-2005, ORRHES work groups met more than 125 times. The minutes of work group meetings are available for review. ORRHES supplied ATSDR and CDC with advice about public health studies and activities about people who may have been exposed to radioactive and chemical emissions from the Oak Ridge Reservation. This fact sheet is a summary of the ORRHES subcommittee. The fact sheet answers questions about ATSDR’s involvement in Oak Ridge, and defines the nature of a public health assessment. CDC and ATSDR requested nominations for the ORRHES and selected members based on citizen input. CDC and ATSDR then selected the members according to the rules governing the Federal Advisory Committee Act (FACA). The ORRHES included individuals with different backgrounds, interests, and expertise. The members received appointments for a four-year term, and consisted of 21 members and liaison members.